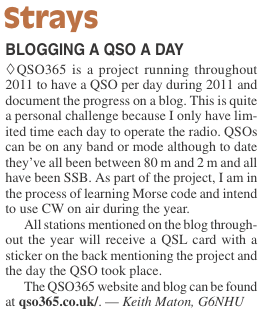 I posted an entry to the blog a few days ago where I reproduced an article about QSO365 that appeared in Practical Wireless magazine. PW isn’t the only place that this website has been mentioned in. The following piece appeared in the March 2011 issue of RadCom and is reproduced with kind permission of the editor, Elaine Richards. This article was published in the April 2011 edition of QST, and is reproduced with kind permission of the editor, Steve Ford. You manage to have a lot of publicity for your project, great. Although till now you don’t get that much replies yet, strange because your blog is really interesting to read. From what I read in the news articles you’re in the process of learning CW, I’m curious how that is developing today. The CW is taking longer than I planned, I’ve had a lot happening recently so it’s taken a bit of a back seat but I am still determined to learn the code and have a QSO using it by the end of the year. 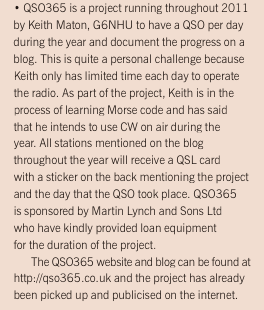 I’m trying to write interesting pieces for the blog inbetween reporting on the daily QSOs and I’m pleased that you’re enjoying it.